Planned road infrastructure developments will create skills training and the development of local labourers in the Eastern Cape. 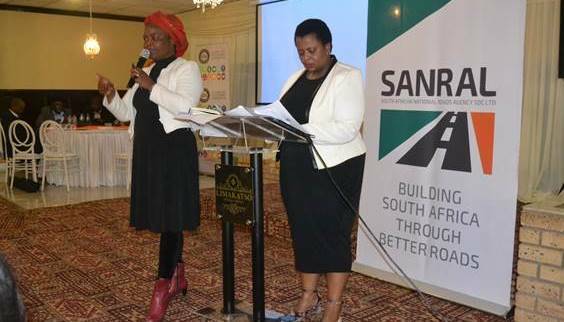 Welekazi Ndika, SANRAL Southern Region Stakeholder Relations Coordinator (left) and Thandiswa Nqunqa, SANRAL Southern Region SMME coordinator addressed SMMEs during the agency’s roadshow held in Aliwal North. The South African National Roads Agency (SOC) Limited (SANRAL) revealed its upcoming road infrastructure development projects for the road network within the Joe Gqabi District Municipality. These were announced at its Small Medium and Micro Enterprises (SMME) Roadshow held at the Limakatso Conference Centre in Aliwal North recently. The engagement session attracted more than 200 guests, consisting of stakeholders from the business fraternity, Local Government, Sector Departments, Engineering Consultants, Contractors, SMMEs, Project Managers and Project Liaison Officers (PLOs). SANRAL manages a road network of 4 950km in the Eastern Cape. This is 22% of its total 22 190km of national road network. Since 2009, SANRAL has injected R33.3-billion into the Eastern Cape’s road network. Of this, R11.7-billion was allocated for the past two financial years and R5-billion for 2017/18. The roads agency has over 160 projects lined up in the province for the next three financial years (18/19, 19/20 & 20/21). These projects are in the initiation, design and construction stages. One of the Southern Region’s top 10 CAPEX projects for the 2018/19 financial year is situated within the Joe Gqabi District Municipality in the Elundini Local Municipality. This project entails the upgrading of the R56 from Indwe through the towns of Ugie and Elliot to Maclear. The project commenced in February 2016 and is nearing completion. The completion date was extended from August 2018. Machethe added that the projects will create skills training and development of local labourers and will accelerate the CIDB upgrading for local SMMEs. Representing the Executive Mayor of the District, Cllr Dumisani Mvumvu, a Joe Gqabi District Municipality Mayoral Committee Member and Portfolio Head of Community Services, encouraged SMMEs to grow. Mvumvu said: “The world is confronted with poor growth economic development and recession. These impact on job creation and the ever-increasing youth unemployment. South Africa is not immune to these realities. Mvumvu added that as a district they appreciate the efforts by SANRAL to build capacity and share expertise with their contractors. “We also wish to commend SANRAL for supporting government’s call to ensure that 30% of the total expenditure in a project goes to the local contractors,” Mvumvu said. SMMEs present appreciated the engagement and requested SANRAL to have follow-up engagements. Welekazi Ndika, SANRAL Southern Region Stakeholder Relations Coordinator, presented the agency’s Horizon 2030 strategy and its transformation agenda, which seeks to transform the construction sector to be more inclusive. She cautioned SMMEs against the trend of demanding projects be ringfenced for wards as this would be shooting themselves in the foot as it would translate to SMMEs only being able to work on projects within their wards and would take a long time to upgrade to a higher grading. Ringfencing or setting aside projects for wards or forums is illegal and against procurement legislation, Ndika said. She also said that project disruptions, office invasions, threats to staff and damage to property are not only a threat to project completion because of delays, but they lead to cost overruns and infrastructure delivery paralysis. She added that SANRAL does not intend to destroy the large construction sector. It is not the intention of the Transformation Policy to reduce standards, compromise quality and erode technical excellence in roads delivery. Speaking on challenges faced by SMMEs in SANRAL projects, Vanda Nqunqa, SMME Coordinator for SANRAL Southern Region, said she was available to assist to ensure that issues raised by SMMEs were speedily addressed and resolved. Athenkosi Mpayipheli, from the Eastern Cape Development Corporation (ECDC), explained the role of the ECDC and how it can assist SMMEs. He elaborated on the various loan options available to SMMEs but highlighted that there was a need to change the current system where subcontractors are paid by the main contractor. He said the delay in payments affects the SMME’s cashflow and can have a debilitating effect on their operations.